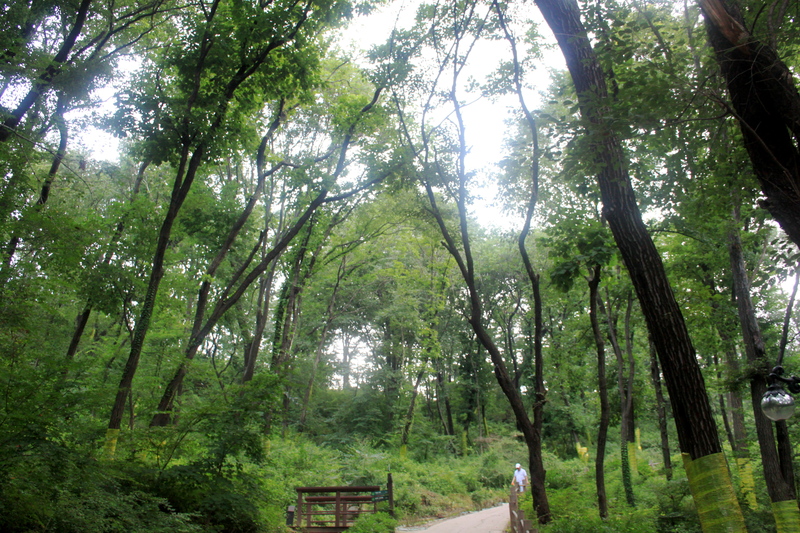 …a solo exploration of South Korea’s capital. As I write (for the first time in a long time) I am sitting in my parents’ living room, the sun has just come out and I am hoping it will stay out long enough to dry the rain-soaked streets so I can go for a run. As ever, when I visit the UK, I am waiting for my visa and my contract to be re-newed so I can return to work. Unusually, this all seems to be ticking a long quite nicely and I am taking advantage of the fact I am not chasing stamp-wielders and dotted line-signers to catch up with all my writing. With a feature on hold until someone replies to my many phone calls, a blog seemed to be in order. When we last spoke, I was jetting away from the silence and peace of Mongolia, and heading to South Korea to round off a three week jaunt away from Qatar. I had hoped to have a brief catch up with an old friend who, in the surprising way life has of throwing old acquaintances back at you, has followed a remarkably similar path to my own career-wise, but in Asia rather than the Middle East. James, it turned, was being sent on deployment the day I arrived, and a confusion of timings meant we did not manage to cross paths. He did, however, lend me both his apartment and his girlfriend as tour guide to make my time in Seoul pass pleasantly. I set out on the first day with little to no plan, and just headed to an area James had said was fun to explore on what was to be the first of many metro-based adventures during my six days in Seoul. My first problem was similar to an issue encountered when first travelling in Arabic-speaking countries before I got a grasp on the alphabet – that I had absolutely no way of working out how to pronounce the words displayed on the signs. (There was English underneath, but my stumbling tongue still couldn’t quite form the right syllables in some cases.) Added to this was the fact that the people I randomly approached either did not speak English or did not want to help. An accidental moment of bliss. Luckily, having lived in a world of incomprehensible letters, I had painstakingly copied out the characters signifying my home station, and a few stops I hoped to reach along the way. 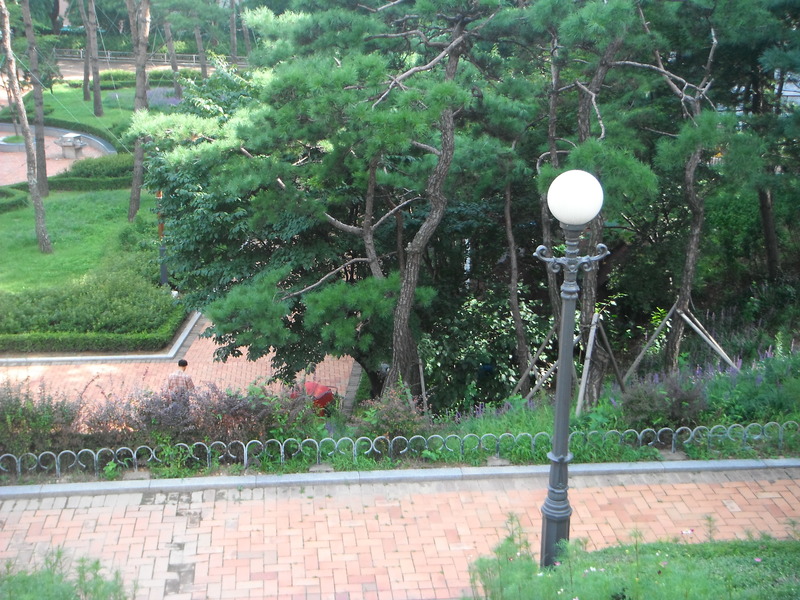 In this way, and with the help of a friendly man who also taught me how to say “thank you” I made it to the City Hall stop and roved around, taking in the Seoul Art Gallery and a narnia-esque garden in the process. (This last bit by total accident – having no sense of direction means you see far more or a city than originally intended.) The biggest shock to my senses at this point was when the construction noise of Qatar was replaced by the sounds of insects filling the air. 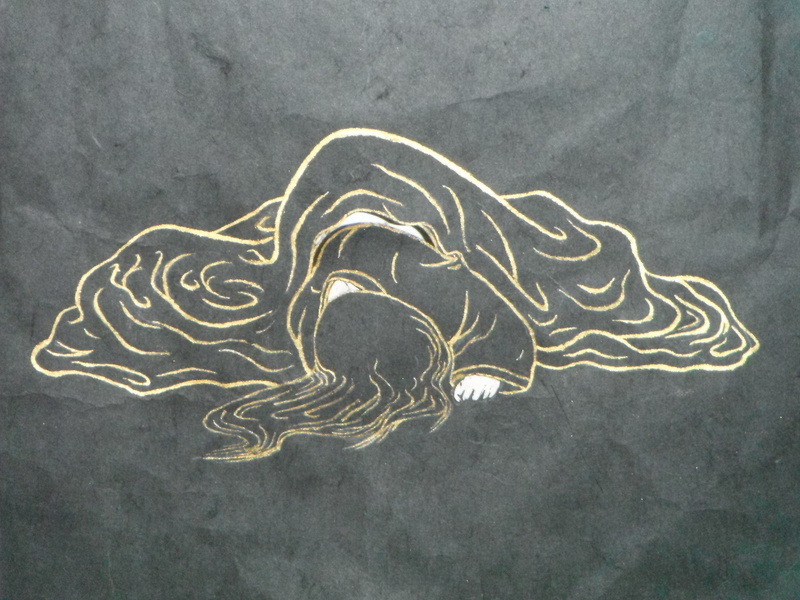 I also came across an exhibition of art depicting the abuse of Korean women during the war. This gallery offered no english translation, but the power behind some of the images meant none was needed and I left feeling like someone else’s pain had washed in to me. Seoul on this first day seemed oddly impenetrable. I had, perhaps arrogantly, assumed English would be widely spoken, but this seemed not to be the case, and I felt useless having to pantomime my way through ordering meals and coffee. Part of the culture shock may have come from the fact I arrived fresh from two weeks of an almost technological celibacy, only to land in a world of lights and machines and slickness. I tried, especially when on the metro, to find relatable figures and behaviours. The school holidays had brought out gaggles of early teenage girls, standing in groups of five or so in the middle of the carriage, giggling, playing with smart phones, all dressed the same to assert their individuality without moving away from the herd. The differences between here and there surround the surface style. There is more neon, more animal motiffs on bags and shirts, they all look younger than their contemporaries in London, who age before their time. I found myself wondering when these girls, with long, straight hair and short shorts transform into the uniform older women, with stiffly permed curls and loose-fitting trousers. Few examples of the intervening stages seem visible, the transformation appears absolute. I voiced this with my guides (who I met up with a little later in the trip) and they laughed at my observation. The story behind why all the older women look the same is quite a poignant one. The ‘ajumma’ – meaning ‘aunt’ (I think) – are seen as hard working, slightly pushy, older women. I couldn’t quite work out if it was a term of respect (as in South Asia) or a pejorative way of talking about the older generation. Anyway, I was told that in the past, where times were much harder and working days were long and difficult, women would have these fixed, tight perms as they lasted and lasted and never moved and the women did not have time in the mornings to style their hair before heading out to work. I got up on the second day with far more of a plan, and a determination not to be culture-shocked out of having a great time in a city so bursting with possibilities. 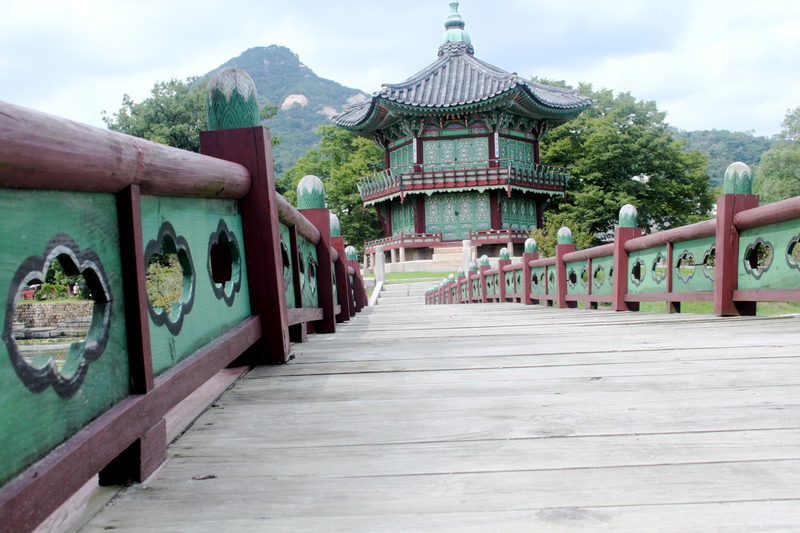 Up and to the Gyeongbokgung Royal Palace, where a Korean/American girl and I drifted together in the manner of solo travellers everywhere and meandered about the place, before taking in lunch (I have no idea what I ordered – but it was delicious) and a calligraphy demonstration. We then wandered off in our separate directions and I cable-carred up to N Seoul Tower (yes, I could have walked but *plurb* to you, I felt like being lazy. 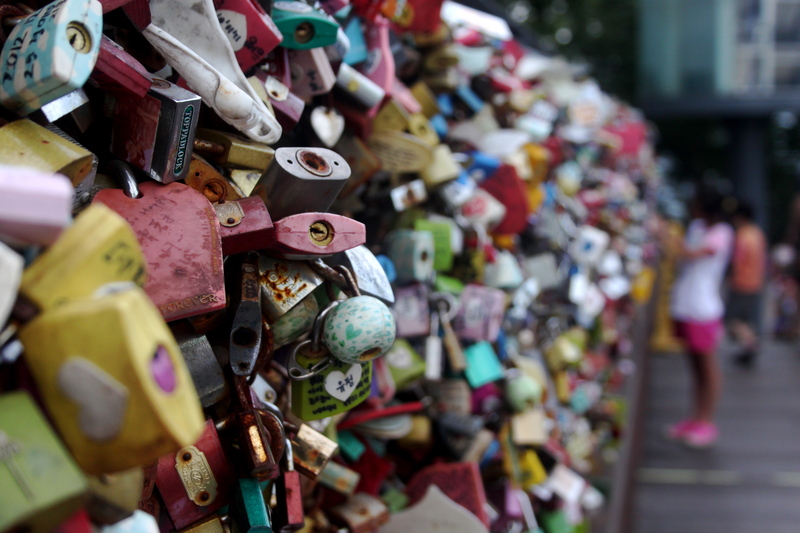 At the top there are various over-priced places to eat and drink, a viewing station which I didn’t pay to go to, and a bunch of really fantastic displays made up of locks left by couples as a token of their love and relationship. It sounds tacky, I know, but the messages and the happiness kind of spills in to you once you get there. 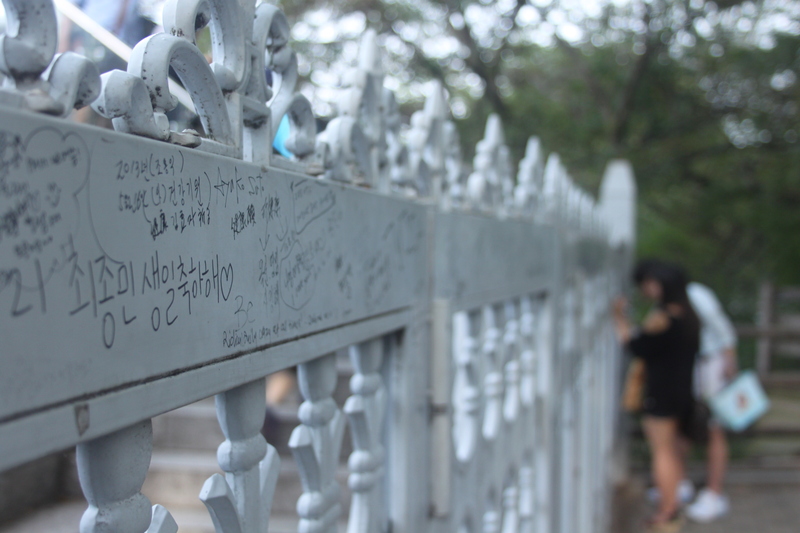 Young couples also write their names on the fences. Love lockets at N Seoul Tower. Guilt at not walking up came in to play, and I set off down the hill feeling all intrepid. This was eroded slightly when, during the course of my hike down the mountain, I was passed by a serene old lady, a women carrying a baby, and two blind men going the other way. My happy wanderings brought me out at Bukchon Hanok village, a traditional 600-year-old urban environment preserved in the heart of Seoul. There, rather unexpectedly, my phone suddenly decided it could find a network provider after all, something it had completely failed to do in the more modern and shiny areas of the city. Getting lost can be the best part of a holiday. 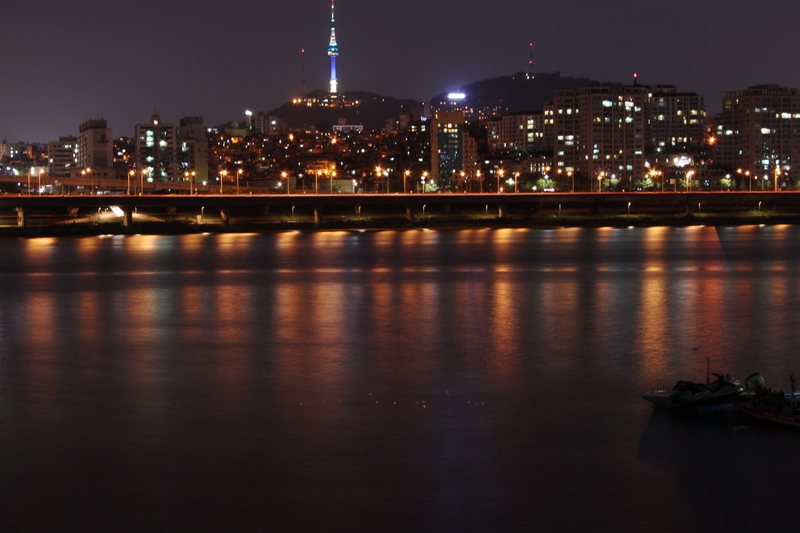 Seoul is marvellous, but, as previously stated, somewhat mysterious at first. My trip would not have been half of what it ended up being without the wonderful Hyojin Kim who I finally managed to meet up with on my third day there. 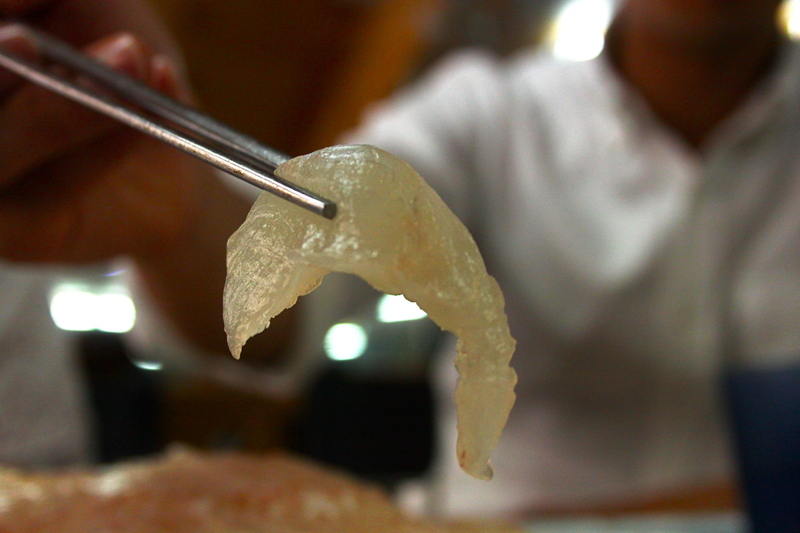 Together with a friend of a friend we explored Seoul’s fish market, where you can purchase fish to be prepared in one of the many adjoining tiny restaurants – resulting in the freshest Sushi you are ever likely to eat. Never able to leave my journalist hat in Doha, we also visited one of Seoul’s under-reported on slums, where I managed to conduct interviews and get some interviews which will hopefully prove useful down the line. One minute from the slum, we sat on over-priced patchwork sofas in one of the most expensive malls in Korea, and I accepted the fact that my brain was never going to work in quite the same way since moving back to the world of reporting. 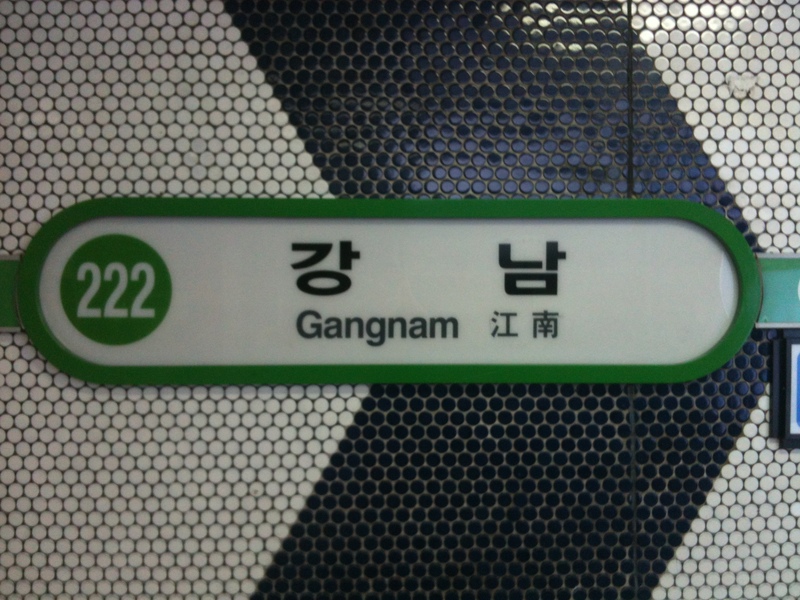 Oh, I also went to Gangnam st….ation. By accident. But still, there it is. By this point in my extensive trip my joy of discovery was starting to wane and I will admit to a certain amount of happiness on my fourth day in Seoul when I was able to have a blissful lie-in before getting up to navigate grocery shopping before heading in to the real world for Korean barbecue and a night-time exploration of Seoul. My fifth day was given up to packing and some last-minute exploring of the city in order to meet some people James had suggested I hang out with. The knowledge that soon my ready access to good beer and pork products would be coming to an end meant that I welcomed an afternoon exploring pubs and tea shops around the admittedly slight more westernised area of Seoul. I was journeying home on the tube when began feeling desperately sad because one of the old women I described earlier was standing by the doors with a cloth pressed to her face. She removed it to reveal a raised, purple eye and cheek bone. No-one was paying her attention, no-one gave up their seat, I was reminded of London in the worst possible way, when everyone looks at the floor and doesn’t ask questions. I felt trapped and isolated, wanting more than anything to speak to her, but knowing my message would never be conveyed successfully. I stood mute and screaming. Then, she sat down between two other identical women and they immediately started talking to her, asking her questions, with faces full of concern. I was relieved they had just not seen, rather than ignoring her. I was more relieved when she mimed falling. In this situations one thinks the worst. I felt so divorced from being able to be a caring member of this society. 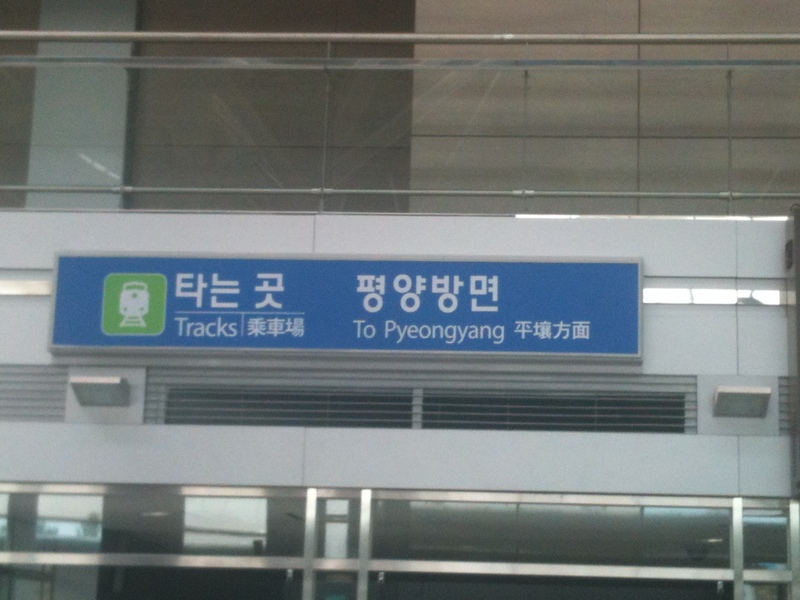 It was an odd experience, walking through tunnels, seeing a train station with a sign boldly displaying “To Pyongyang” feeling the futility of the fact that the tracks just stop, that a train has never run, that signs stating “the beginning of unification” seem pathetically optimistic. Above all that is the surreal way the place feels slightly like an amusement park. Signs and sculptures are everywhere. The propaganda reel says that when re-unification happens, they want the area to be a place of happiness and joy. 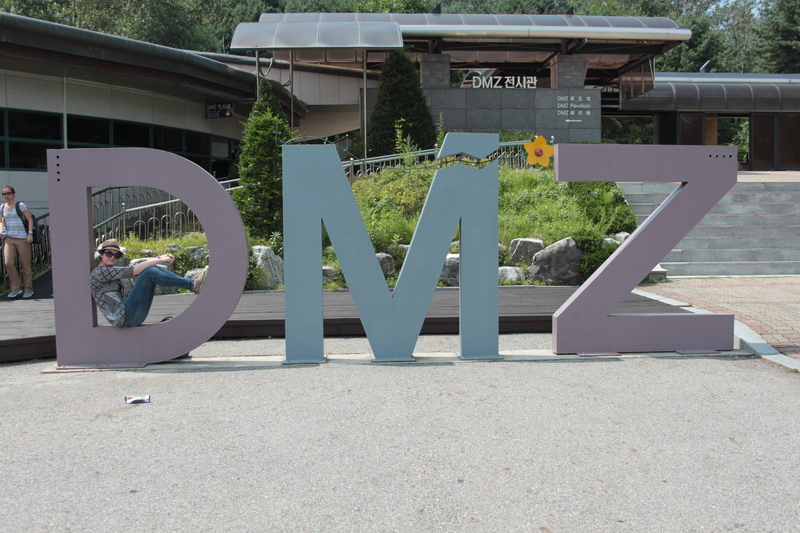 There were serious and interesting bits to the DMZ as well. You can stand facing North Korea, as heavily trained South Korean soldiers stand guard behind blue box-like buildings where the two sides can meet. A low concrete line can be seen spanning the floor as the point that South becomes North. By the end of the day, and the end of the trip, I was feeling exhausted. Nearly three weeks of adventures and new experiences and filling myself up with all the amazing tales I can now tell was been wonderful and refreshing, but I had never felt more ready to return to Doha. Seoul is full of lights and sounds and unexpected corners that lead to hidden gems. It is a city to explore, but it is also a city to share. The last few days of having people with me, showing me their favourite places and the hidden souls of Seoul made the tip better than I ever could have hoped, but it reminded me of the bad, as well as the good, of travelling alone. I found peace being able to roam at my own pace, not stop until late, or coming back to the calm of the flat if it all became too much. It is the singular joy of travelling alone that one feels no obligation to do anything and can enjoy a new place and savour it in ones own way. With that, however, comes the loss of shared experience. A knowledge that to do something, to struggle through a mountain, or to stand in the baking heat to witness a particular event, is done purely to say “I did this” and to have no-one to laugh with about the arduous nature of the trials that were gone through so the reward could be enjoyed. It is not to say I did not adventure and experience and live during that week. Travelling alone opens doors to new friendships that might never have happened if the acquaintance had seen two people standing in a doorway instead of one. As with everything, I would not change my trip, but I wonder how it might have changed if someone else were here as well.